Beware those scientific studies — most are wrong, researcher warns – A few years ago, two researchers took the 50 most-used ingredients in a cook book and studied how many had been linked with a cancer risk or benefit, based on a variety of studies published in scientific journals. “The majority of papers that get published, even in serious journals, are pretty sloppy,” said John Ioannidis, professor of medicine at Stanford University, who specializes in the study of scientific studies. Read More > at Yahoo! Did Brown fix California’s budget mess? Nope – Jerry Brown signed the 16th and final state budget of his two-part gubernatorial career last week, and bragged a bit. Those last two assertions are, unfortunately, just half-truths. Although he has been relatively tight on the spending side of the ledger—relative, that is, to the Legislature’s Democratic majority—Brown has nevertheless raised overall spending by 50 percent in seven years for benefits that will be very difficult to reduce if recession strikes. A 50 percent increase in per-pupil school spending is locked into the state constitution. New entitlements for health and welfare benefits, including an earned income-tax credit for the working poor and a huge increase in Medi-Cal health coverage, are politically sacrosanct. Moreover, David Crane, an investor and university lecturer who delves into state finances as an avocation, calculates that California has added more than $200 billion in debt during the last decade. …Brown is proud of persuading voters to create the “rainy-day fund” and has not only filled it to the legal limit but created a few other reserve funds, all meant to cushion the impact of a future recession—one he says California is overdue to suffer, based on historic economic trends. All told, the state now has, or soon will have, about $16 billion in such reserves, and it’s certainly better than nothing. Patriotic California? Well, sort of – A financial advisory firm called WalletHub recently issued a study listing the states according to how patriotic they are. Care to guess where California wound up? With July 4 loomimg, we thought we’d take a look. We’re 44th out of the 50 states. We are more patriotic than Connecticut, New York, Illinois, Rhode Island, New Jersey and Massachusetts, which ranked 50th. Drones replace July 4th fireworks in western towns worried about wildfires. But where’s the ‘boom’? – Towns in California, Colorado and Arizona – facing another season of drought and wildfire – are turning to drone shows as a less dangerous alternative to organized fireworks, encouraged by the development of jaw-dropping, choreographed shows such as the one Intel prepared for the Winter Olympics broadcast. Travis Air Force Base outside San Francisco, just an hour south of the Yolo and Napa county fires forcing evacuations, is trying an Intel drone show this year. Aspen, Colorado, and towns in Arizona – which had shelved fireworks shows because of fire risk – are also experimenting with drone shows. Facebook Algorithm Flags, Removes Declaration of Independence Text as Hate Speech – America’s founding document might be too politically incorrect for Facebook, which flagged and removed a post consisting almost entirely of text from the Declaration of Independence. The excerpt, posted by a small community newspaper in Texas, apparently violated the social media site’s policies against hate speech. Since June 24, the Liberty County Vindicator of Liberty County, Texas, has been sharing daily excerpts from the declaration in the run up to July Fourth. The idea was to encourage historical literacy among the Vindicator’s readers. How Many Teenage Girls Deliberately Harm Themselves? Nearly 1 in 4, Survey Finds. – Up to 30 percent of teenage girls in some parts of the United States say they have intentionally injured themselves without aiming to commit suicide, researchers have found. About one in four adolescent girls deliberately harmed herself in the previous year, often by cutting or burning, compared to about one in 10 boys. Antioch paves way for cannabis retailers and related businesses – The city now is developing rules for marijuana retailers and related businesses, which can start requesting permits to operate in Antioch later this month. Over the objections of most residents who turned out for last week’s council meeting, Antioch City Council in a 3-2 vote approved an ordinance that will allow various types of cannabis-based commerce in two areas of town, including stores selling the drug for medicinal and recreational purposes. Google is letting third-party developers access your Gmail Inbox: Report – The Mountain View tech giant, Google, has been allowing third-party app developers to scan through inboxes of Gmail users, according to a recent Wall Street Journal report. In June last year, Google stopped scanning user’s emails, which was being done to provide personalised ads. Despite curtailing the inapt practice, it has allowed hundreds of third-parties to continue doing the same. The curse that sank Toys R Us is now haunting J.Crew – J.Crew is in danger of falling victim to a curse that has been haunting retail for years. Though falling sales have plagued the chain for years, its biggest problem doesn’t seem to have anything to do with an inability to keep up with the latest trends. It’s actually the millions of dollars in debt the retailer has carried since 2011, when TPG Capital and Leonard Green & Partners helped it buy itself through a $3 billion leveraged buyout, taking the company private. Toys R Us is a cautionary tale for J.Crew. It, too, was left with a large amount of debt as a result of a leveraged buyout. Bain Capital, Kohlberg Kravis Roberts, and Vornado Realty Trust together invested $1.3 billion in a $6.6 billion leveraged buyout in 2005, taking Toys R Us private. The Warriors Are Making A Mockery Of The NBA Salary Cap – It’s probably clear by now just what a steal Cousins is at $5.3 million, but here’s one more note: Our CARMELO projection system, which spits out fair dollar values for every player’s production, thinks Cousins should be worth about $46.1 million next season. The NBA’s maximum salary rules preclude him from getting quite so much, of course, but he still figures to be worth far more than the mid-level pittance Golden State is doling out for his services. From Cousins’s perspective, it does make some sense to cut this particular deal. He’s coming off a major injury last season, and he may not be available to the Warriors until after the 2018-19 season begins. The Pelicans’ unexpected surge without him during the playoffs reinforced old questions about Cousins’ ability to win, and the market for bigs was looking cash-poor anyway this summer, with the repercussions of 2016’s wild spending spree crashing down on teams’ cap and luxury-tax budgets. According to The Undefeated’s Marc J. Spears, Cousins didn’t receive any “significant” contract offers when free agency opened up. So instead, Cousins is gambling that he can fit in with the Warriors’ legendarily unselfish group for a year, produce solid numbers, ease back into health, win a ring — and in the process, ditch his longtime label as a me-first malcontent. If all goes according to plan, he’ll be due for a much bigger payday next summer than he could’ve gotten had he played the normal free-agent game this summer. New report outlines costs and benefits of self-driving technologies – The report found that by 2050, autonomous vehicles (AVs) will add between $3 and $6 trillion in cumulative consumer and societal benefits to the U.S. economy. Annually, $800 billion in economic and societal benefits could be realized when AVs are fully deployed. Nearly every American will benefit from improved safety; enhanced access to transportation for senior citizens, people with disabilities, and the disadvantaged; increased productivity; and the ability to gain productive time for work or errands. Pain control: “no evidence” cannabis improves outcomes – Depending on who you listen to, medical cannabis is either a rising star in the world of therapeutics or an over-vaunted pariah that should never have exited the grubby world of the illicit street corner deal. Coal’s Coming Renaissance in the Middle East – Egypt’s President Abdel Fatah el-Sissi faces little opposition as he begins his second term, but the former field marshal has an immediate challenge coming in just a few weeks’ time. The Egyptian government budget that will be unveiled in July is pushing ahead with cuts to fuel and electricity subsidies that could see prices for both rise by 60 percent and 55 percent respectively. A growing population and underequipped power sector have left Egypt with a continual energy shortage, with summer blackouts and regular shortfalls a fact of life since 2011. As part of its response, Egypt plans to build a major new coal plant at Hamrawein on the Red Sea. The government announced last month that it had received three competing offers from international consortiums including companies from China, Japan, and the United States to build the 6 gigawatt facility. Coal currently accounts for less than 1 percent of primary energy production throughout the Middle East, but that is expected to change over the next decade as other countries join Egypt in reshaping the energy landscape. While Israel aims to fully expel coal from its energy mix by 2030, the United Arab Emirates, Oman, Jordan, Turkey and Iran all have plans for new coal capacity. With coal the bugbear in most energy debates, why is it unexpectedly gaining popularity throughout a region rich in oil, gas, and solar power? …For all of these governments, the risks to the environment and the global fight against climate change are outweighed by the imperative of reducing exposure to supply shocks and the threat they pose to regimes. In countries such as Egypt, the gradual recovery from post-revolutionary havoc is contending with population growth and the need for reliable and stable energy supplies. Outside suppliers are perfectly aware of that demand. Where multilateral financing institutions like the World Bank are unwilling to back new fossil fuel projects, countries such as China provide both expertise and low-cost financing instead. Chinese power and engineering companies are spearheading the construction of coal factories such as Hamrawein, where the Chinese consortium produced the lowest bid. Chinese companies have until recently faced little to no serious competition from Russia or the United States, although General Electric is part of the Hamrawein bidding. …None of this, of course, is good news to environmentalists. With the future of the fight against climate change resting in the balance, the question remains: Is there an alternative to coal in today’s Middle East? López Obrador and the Future of Mexican Democracy – Yesterday, Andrés Manuel López Obrador, best known by his initials, AMLO, won Mexico’s presidential election decisively. After 18 years on the campaign trail, including two previous failed presidential runs, thousands of rallies, and, by his count, a visit to every one of Mexico’s 2,400 municipalities, the Tabasco-born politician received the support of 53 percent of voters at the polls, according to an offical rapid count by electoral authorities. Meanwhile, the National Regeneration Movement (MORENA), López Obrador’s four-year-old political party, gained a majority in congress, and a majority of the nine governorships up for grabs. Banning plastic straws is more scam than science – Seattle just became the first US city to impose the trendy ban, and New York may soon follow suit, with Mayor Bill de Blasio backing an anti-straw City Council bill. Tip: Viagra Is Great for Bodybuilders – Few drugs have had such a social impact on society. Old men, or even not-so-old men, could suddenly indulge in a part of life they thought was lost to them. But perhaps unexpectedly, much younger men also glommed onto the drug, as they also did with its chemical cousins Cialis and Levitra, which would arrive later. They covet the drugs because they serve as a hedge against performance anxiety and reduce downtime between sexual episodes, but it turns out there are other reasons men, both young and old, might use these drugs and they’re not only health related, but bodybuilding related, too. In fact, there may be sufficient evidence to support the idea of taking these drugs every day, like vitamins or any other health-promoting supplement. MS-13 is ‘taking over the school,’ one teen warned before she was killed – From New York to Virginia to Texas, schools in areas racked by MS-13 violence are now struggling with a sobering question. What to do when the gang isn’t just in your community, but in your classrooms? Faced with an influx of scores of unaccompanied minors and an uptick in gang violence, Brentwood High has been criticized both for doing too little and too much to address the problem. Meanwhile, a class-action suit brought by the American Civil Liberties Union against the Trump administration alleges the school went too far, hastily labeling kids as gang members and leading to their wrongful imprisonment. School officials say they walk a fine line, reporting illegal activity while respecting students’ rights. Starting in 2013, thousands of unaccompanied minors — most from Central America — began entering the United States illegally from Mexico each month, many turning themselves in to authorities. More than 200,000 have been detained, screened and then placed with relatives by the Office of Refugee Resettlement. Nearly 5,000 have been sent to Suffolk County. SF’s appalling street life repels residents — now it’s driven away a convention – In a move that is alarming San Francisco’s biggest industry, a major medical association is pulling its annual convention out of the city — saying its members no longer feel safe. D’Alessandro declined to name the medical association, saying the bureau still hopes to bring the group back in the future. Whoa! Meet the future phones that fold up, have 9 cameras and charge over thin air. – Picture this: You pull your phone out of your pocket and unfold it like a napkin into a tablet. You press your finger on the screen, and it unlocks. You switch to the camera app, and a spider-like array of lenses shoot simultaneously to capture one giant photo. …From the front, the iPhone 8 is pretty much indistinguishable from the iPhone 6 that came out nearly four years ago. Americans are holding onto old phones longer than ever — 25.8 months, according the most recent research from Kantar Worldpanel. Phone snaps could soon compete in quality with big-honking-lens cameras. How? By covering the back of the phone with a bunch of small lenses that shoot simultaneously — and then stitch it into one big photo. Californians cross border to vote in Mexican election – Waiting to vote were mothers pushing strollers, airline passengers pulling luggage, groups of friends on vacation and a dozen nuns wearing full habit. Literally feet from the border, the station also proved convenient for many Mexicans living in southern California — both dual U.S. and Mexican citizens or U.S. legal residents. As in other Mexican presidential elections, the National Electoral Institute set up special polling stations across the country for “voters in transit” — often at bus stations, airports, even hospitals. Early Sunday, a half-dozen Tijuana special stations were mobbed with these voters. …Mexicans living abroad have since 2006 had the option of casting votes by mail in their country’s presidential elections. This year’s election for the first time allowed them to register without returning to Mexico, and more than 180,000 had done so by May, according to the Electoral Institute. A Scandalous Abuse of the Legislative Process – In a startling abuse of the legislative process, a budget clean-up bill has just been used to sneak in radical and never-debated changes in the criminal justice system. It allows a defendant suffering from a mental disorder to be granted pre-trial diversion and the charges later dismissed for any crime if a judge finds the disorder played a significant role in the crime and if a defendant has “substantially complied” with mental health treatment during the diversion period. In short, this new law allows diversion and the dismissal of charges for any crime, including those where a victim was killed or seriously injured. Weaponizing the Initiative Process – Three ballot initiatives with enough signatures to qualify for the November election were pulled by the proponents when legislative deals were worked out satisfying the initiative sponsors. The initiatives were used as blunt instruments in forcing legislative compromise and in these three instances it worked. Expect to see more of that in the future. An initiative to make it tougher to pass taxes was put aside when a bill signed by the governor prohibited soda taxes for a dozen years, satisfying the main financial sponsors of the initiative, the soda industry. A bill toughening privacy laws with data collected from Internet users prevented a tougher privacy measure from going forward. And the promise to scuttle three bills aimed at paint manufacturers persuaded those manufacturers to stop their initiative effort to place a bond on the ballot to clean up lead paint in homes. New Evidence That the World Really Is Getting Better – If you allow your perception of humanity to be shaped by the news, it is easy to lose sight of the narrative of human progress. Struggling democracies, suicide epidemics, climate change, and acts of violence are among the daily headlines that continue to overwhelm us with angst. It seems like every year is getting worse. Mainstream news channels are dominated by the idea that “If it bleeds, it leads.” Psychologists have long shown that people tend to read articles with negative tones over positive ones. Biologically, our brains are wired for a pessimism bias, which urges us to pay more attention to negative news. So you’re not constantly seeing negative headlines because the world is getting worse; you’re constantly seeing negative headlines because that’s what audiences react to. Social media has also created an echo chamber in which these headlines travel at the speed of light. Yet the solution isn’t to stop reporting the problems in our world today. In fact, it is critical for us to acknowledge the many challenges and atrocities in our modern-day society. However, focusing disproportionately on bad news is detrimental to our sense of empowerment as a species. …Before you panic, it’s important to recognize that 30 years ago, there were 23 wars, 85 autocracies, 37 percent of the world population in extreme poverty, and more than 60,000 nuclear weapons. From this perspective, 2017 doesn’t seem too bad after all. We are living longer than ever before. For most of human history, life expectancy at birth was around 30. Today it is more than 70 worldwide, and in the developed parts of the world, more than 80. Under Tesla, SolarCity — once king of rooftop solar — slips into shadows – Five years ago, SolarCity ruled the rooftops. No other company in the fast-growing solar industry installed nearly as many panels on American homes. The pace of installation was accelerating quarter after quarter, leaving such rivals as Sunrun and Vivint far behind. Then electric auto manufacturer Tesla bought the company. Now, what once was SolarCity appears to be fading away. Installations have plunged 62 percent. Reuters, citing internal Tesla documents, recently reported the company is closing a dozen installation facilities across the country, part of a broader restructuring within Tesla that cut 9 percent of the company’s workforce. In announcing the cuts to Tesla staff, CEO Elon Musk also said the company will stop selling solar arrays through Home Depot, moving some of the salespeople involved to Tesla stores while letting others go. …The company grew quickly, commanding 33 percent of the residential solar market in 2015, according to GTM Research. Utah’s Vivint Solar had 11 percent of the market, while Sunrun of San Francisco had 5 percent. When you finish this editorial, pick up a book – In taking some time this weekend to read this editorial, you are part of the shrinking portion of the public that uses leisure time to read. Pleasure reading is at an all-time low, a new study shows, and the culprit is television. More TV and less reading leaves people less imaginative, less informed, and less fully alive. The trend needs to reverse. Tech mobilizes against California privacy law – The tech industry is mobilizing against a new California privacy law, likely the toughest in the country. The California Consumer Privacy Act was rushed through the state legislature, where it was approved unanimously, and quickly signed by Gov. Jerry Brown (D). The new law requires websites to show users what data is collected on them, what the data will be used for and to identify third parties who have been given access to the data. Internet users will also have the right to opt out of having their data collected and sold and to request that their information be deleted. It is one of the most comprehensive privacy laws passed in the U.S. and comes after the European Union implemented a set of data privacy regulations that cracked down on data collection practices. In Denmark, Harsh New Laws for Immigrant ‘Ghettos’ – Starting at the age of 1, “ghetto children” must be separated from their families for at least 25 hours a week, not including nap time, for mandatory instruction in “Danish values,” including the traditions of Christmas and Easter, and Danish language. Noncompliance could result in a stoppage of welfare payments. Other Danish citizens are free to choose whether to enroll children in preschool up to the age of six. The Deadliest Drug – Most Americans have a general sense that drunken driving isn’t as bad a problem as it was a generation ago. But few realize how much those numbers changed in a relatively short time. When the federal government started counting alcohol-impaired traffic deaths in 1982, there were more than 21,000 a year. By 2011, the death toll was down by 53 percent. States had raised the legal drinking age to 21 and adopted a common rule that a blood alcohol concentration (BAC) of .08 meant “too drunk to drive.” Many states also mandated the installation of interlock devices to prevent those with a history of drunken driving from turning on their ignition unless they were sober. Those laws, coupled with education and prevention campaigns, helped reduce drunk driving deaths to fewer than 10,000 in 2011. …The report provided a package of policy recommendations, one of which was for every state to lower the legal BAC limit from .08 to .05. In practical terms, that would mean most women couldn’t drive after two glasses of wine in an hour; most men couldn’t drive after three. The report is only the latest to call for a more stringent BAC limit: The National Transportation Safety Board has also called for a lower level. Up to now, no state has imposed a limit of .05, but that’s about to change. Utah will go to .05 in December. In the past year, Delaware, Hawaii, New York and Washington state have also considered legislation to lower the limit. Coming Soon: The 100 SF Home – As housing becomes less and less affordable in major cities around the world, governments, developers and designers are looking for ever-more radical solutions. One area of focus is micro-apartments, and one architect has come up with one of the smallest solutions yet. 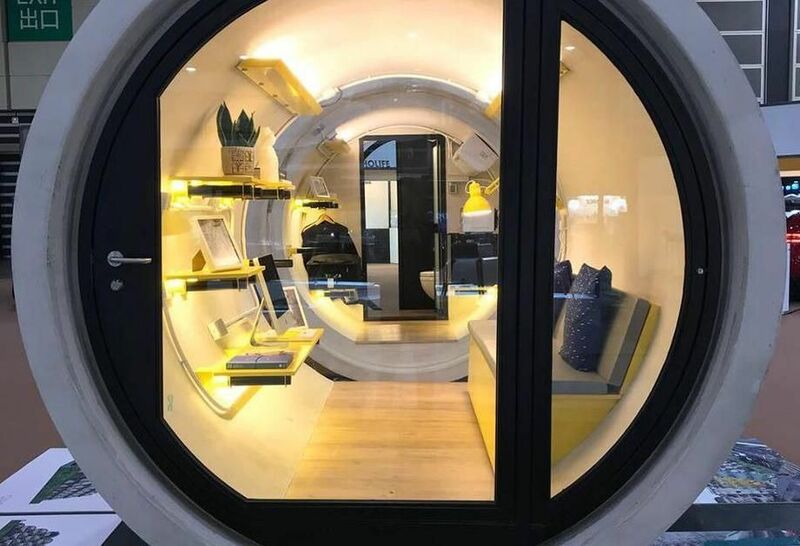 Earlier this year Hong Kong-based James Law Cybertecture unveiled designs for homes inside concrete water pipes, called OPods. And they are only 100 SF. The homes include a bench that folds out into a bed and cooking and bathroom facilities, as well as space-saving furniture.